From 2010 : Their father was an airman (RAF), captured and tortured as a prisoner of war during World War II, here in then, Malaya. But the trauma he faced did not stop the late Toh Boon Hock from encouraging his children to join the armed forces. And four of his six sons ended up enlisting in the navy, air force and the army. A tri service family at that! 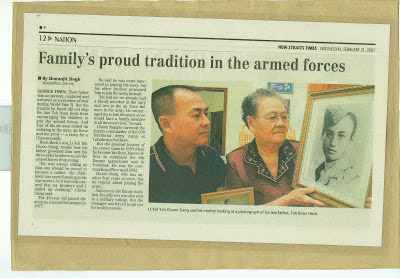 Lt Col Toh Choon Siang and his mother looking at a photograph of his late father, Toh Boon Hock (click on image to enlarge). Boon Hock's son, Lt Col Toh Choon Siang, recalls how his father groomed him and his three brothers to join the armed forces from young. "He was always telling us that one should be proud to become a soldier. Our childhood was spent listening to his war stories. So it was only natural that my brothers and I ended up enlisting," Choon Siang said. The 48 year old joined the army in 1977 and was commissioned as a Second Lieutenant. The greatest honour for this warrior was when he became the first Chinese officer to command the elite 8th Ranger (Parachute) Battalion. Lt Col Toh commanded that battalion from 1999 until 2002. 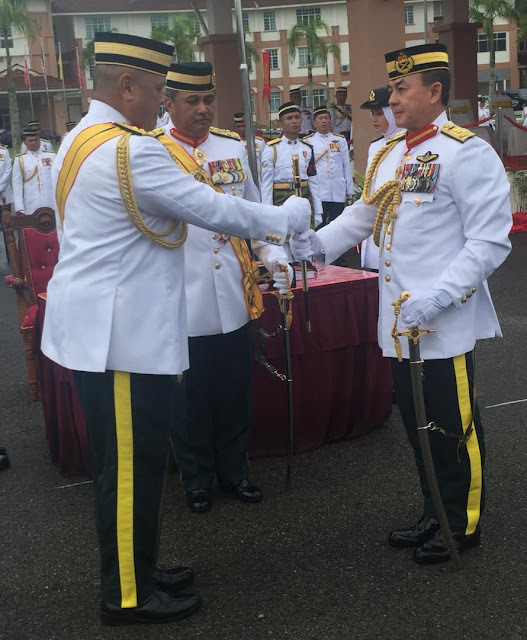 He attended the Queenscliff Command and Staff College 1992, along with another officer from his batch, Major General Zulkiple Kassim (rank of Major during course), who is the current GOC of the 4th infantry Division. If at all Lt Col Toh's mother were to hear Zahid's racist rants she would be devastated and most probably cry. This mother, not every mother would do this, gladly allowed her four sons to serve Malaysia as soldiers. It was not during peacetime either, the Communist Insurgency was at its height! Lt Col Toh's eldest brother retired from the Royal Malaysian Navy in 1999 after 34 years of service with the rank of Commander (equivalent to Lieutenant Colonel in the Army), 2nd eldest brother retired in 1993 with the rank of a Captain RMAF ATC at compulsory age 45 and 3rd eldest retired in 1998 with the rank of a Flight Sergeant from the RMAF after 22 years of service. Not forgetting that his late father was an airman in the RAF and taken prisoner of war to Japan from 1942 to 1948 and he was one of the lucky few to return to Malaya alive. He then joined the home guard for 2 years before joining the Customs till he retired at the age of 55. His mother still receives his dad's pension until today. He has been a Lieutenant Colonel for 11 years, five of his batch are Generals now, there is even a 3 star General who is 4 years his junior. I know of one Chinese Officer, a Major, my junior, whose uncle was my classmate, the late Major Chan Boon Tian of the Engineers, the nephew was the son of a lorry driver in Teluk Intan, was best student in the Armed forces Staff College 1999 (I think) and yet to be promoted. Another Officer, an Indian, was ridden like a horse at Infantry Directorate writing the Infantry Doctrine for a couple of years. He finally left, as Hewlett Packard made him an offer (country manager) that was too good, for him to refuse. There are far too many such cases to list down here. So Zahid Hamidi how many of your family members have placed their lives in harm's way defending this country? You have described the Non Malays as not patriotic. Can you even imagine how hurt the mother of Lt Col Toh would feel, if she ever got to know that you belittled the Non Malays, which is also directed towards her sons. She placed 4 of her sons in harms way, you insult her. I am sure alot of ex servicemen would like to reciprocate to you on her behalf. Well, they would want to suggest to you that you do the impossible act of self impregnation. There are many more Non Malays, whose stories have been untold and unwritten, they just faded away. "The 3 most honourable professions in this world are teaching, nursing and soldiering, not necessarily in that order" - Quoted by my ex boss of PLAW - Brigadier General Datuk Shukor bin Abdullah. Here is another quote, this time, from me, "the two most dishonourable professionals in the world are prostitutes and politicians, they remain in that order".